Split weekends can cause some problems for NASCAR TV partners as their resources get stretched. NBC was no different. Some people went to Iowa while others went to Pocono, expanding a crew with additions that don’t cover the sport full-time. Regardless, viewers got 600-plus miles of racing over the weekend. Both of them were quite interesting in their own right while NBC mixed up their coverage a bit. Sunday (July 29) saw Monster Energy NASCAR Cup Series teams take on the scalene triangle for 400 miles of keep-away. The goal was to keep the lead away from Kevin Harvick, who started this race in the rear after failing post-qualifying inspection. Naturally, the situation that led to this game led off a shortened Countdown to Green, as it should. Had Harvick passed post-qualifying inspection, Sunday’s race would have been quite different. Likely the biggest story of the day out of Pocono was Darrell Wallace Jr.’s huge crash in Turn 1 during the final laps. That was legitimately a nasty crash caused by brake failure. By failure, I mean that the entire right rear brake rotor self-destructed like one of Chief Quimby’s messages to Inspector Gadget. Granted, that was not the first time such a failure happened there. In last year’s Axalta presents the Pocono 400, Jimmie Johnson had a very similar crash for the same reason. At the same time, Jamie McMurray had another brake failure and crashed just behind Johnson. Steve Letarte talked about Jeff Gordon having a big wreck in Turn 1 under similar circumstances as well back in 2006. The common denominator in all four of these wrecks is a substantial brake failure. Turn 1 at Pocono might be one of the toughest tests for braking in all of American motorsports. Teams should look at wrecks like these and think twice about closing off those brake ducts completely. The crash on Sunday more or less woke everyone up because it seemed like the race was just about over. There was legitimate concern about Wallace since that was a huge hit. The rookie driver, by the way, was no different than veterans Gordon or Johnson. He had to take a minute to compose himself after that. The footage available of the wreck was not necessarily the best. However, NBCSN did get footage of the brake parts exploding out of Wallace’s car. The move into the grass, also shown was designed to slow the car before the inevitable wall contact. I guess it helped a little. The interview outside of Pocono’s Infield Care Center put a smile on my face. I just hope Wallace doesn’t get any flack for his comment about not being pregnant after his ultrasound. The young driver was just glad that he was OK, albeit sore as heck. Pocono races tend to be pit strategy affairs, especially since the stages were introduced. Sunday saw even more of that than normal with Harvick’s car being so good. Teams were taking two tires at every opportunity to keep Harvick back in the pack. They found that he wasn’t invincible out of the lead and stuck in traffic. As a result, Harvick led only 30 laps all day. NBCSN was wise to this maneuver early on, pretty much as soon as the penalties were announced. On-track action was decent at times. Pocono races tend to get spread out, but NBCSN did a decent job in keeping the telecast lively. There was good coverage of the various issues on the afternoon, like Brad Keselowski’s tire issue that led to his crash. Admittedly, the fact NBCSN was focused on Keselowski and Johnson when the crash happened was rather fortuitous. Regardless, he was in the middle of a battle at the time. Even if NBCSN wasn’t going Through the Field, they likely would have been focused in on those two anyway. Post-race coverage was about average. The two winner’s interviews still seem redundant. I just don’t get the philosophy. Why? It just takes time away from other storylines. In addition to Kyle Busch’s two on-camera sessions, viewers saw a few more interviews and some analysis. There was also footage of a post-race spin for Aric Almirola after contact from Matt DiBenedetto. The two later argued with each other on pit road. No idea what started that mess. Had Almirola not spun out late while trying to avoid Ricky Stenhouse Jr. it likely never would have occurred. Ultimately, Sunday’s broadcast wasn’t half bad. Yes, the race got spread out at times, but that’s Pocono. Can’t prevent that. What NBCSN has to do is to make the best of what they’re given. You show as much action as you can while keeping the viewers updated on what’s going on. They did a decent job of that. I just wish we were able to get more background on the whole Almirola-DiBenedetto spat. That conflict seemed to come out of nowhere although I don’t expect it to rev back up soon. For NASCAR XFINITY Series teams, they made the haul out to Iowa for their second visit of the season. Once again, viewers got a very competitive race on the seven-eighths of a mile track. Unfortunately, viewers also got a discount broadcast. Like FOX Sports did in June, NBCSN went with a remote telecast. The press release for last weekend did not make note of that. With the regular crew in Pocono, NBCSN went with Dave Burns on play-by-play Saturday (July 28). Unlike his days with ESPN, Burns gets plenty of reps in the booth since he’s one of the primary commentators on NBCSN’s coverage of K&N Pro Series East and West races. Burns was joined by Dale Jarrett, who doesn’t get a lot of booth work these days but is still pretty fresh. In the pits, Parker Kligerman was joined by newcomer Brendan Gaughan, who was a compelling choice. From the start on Friday, Gaughan made for some interesting commentary. In practice, he spent a significant amount of time talking about the patches in Turn 4 and how they take rubber differently from the rest of the track. Interesting notion. Also of note, no less than three drivers (Tyler Reddick, John Hunter Nemechek and Tyler Ankrum) wiped out there while NBCSN was on the air. The Ankrum spin occurred during NASCAR America Live, which was on while the K&N Pro Series teams were qualifying. That raised some eyebrows at the time and made Gaughan look like a genius. The thing with Gaughan is that he probably would have worked better in the broadcast booth than in the pits. He really didn’t help Kligerman out all that much. In practice, Gaughan was more like a roving reporter ala FOX’s Jeff Hammond a couple of years ago as opposed to an actual pit reporter. Kligerman had to take care of most of the pit functions by himself. Having said that, Kligerman did do well in his role. Gaughan did bring some interesting commentary to the table. For instance, he outright blamed Cole Custer for losing the lead to Christopher Bell on Lap 116. That is rare. Custer simply fell victim to a pick. Usually, you hear about the triumphant driver using the pick, not the other way around. The lower-budget broadcast did lead to some issues. For example, viewers never really saw what happened between Matt Tifft and Max Tullman to bring out the caution that led to the red flag. In an interview with Gaughan, Tifft noted that David Starr got into Tullman and cleaned him out. Another example is whatever ultimately happened to Ryan Sieg early on. The broadcast showed Sieg on the apron with what looked like a flat left rear tire on Lap 73, struggling to get onto pit road. No caution was thrown. Then, we didn’t hear anything for 36 laps until Kligerman noted that Sieg had gone behind the wall. Tough weekend for us in Iowa. Had issues with the rear end which put us behind the wall for repairs and multiple laps down. Proud of the effort and hard work by the entire team. A big thank you to Lombard Bros. Gaming for supporting us. Moving on to Watkins Glen. Sieg ultimately returned to the race and finished 34th, the final car still running, 51 laps down. No mention was made of him returning to the event. Since the race ran long, post-race coverage was somewhat abbreviated. Viewers got interviews with a happy Bell and an angry Justin Allgaier. I’m sure that viewers would have wanted more but they were already cutting into the primetime coverage of Tour de France Stage 20. Gaughan mentioned that he tried to get an interview with Ross Chastain but was unable to do so. Speaking of Chastain, he got a fair amount of coverage on Saturday. The ongoing story with him is that he outperforms his equipment on a regular basis. Normally, that tends to get you rewarded with better rides. Not so much these days, although it was noted that his JD Motorsports team has sponsors willing to step up with additional funding should Chastain make the playoffs. For now, it’s looking pretty good for him. Overall, NBCSN’s on-track coverage was pretty good. A decent amount of side-by-side action made air and what viewers got was generally pretty exciting. In the past, the high line really only got used in the ARCA race. I remember being amazed when Kyle Weatherman made good use of it in an ARCA race back in 2013. Now, we have multiple usable grooves. Good stuff. The remote broadcast did lead to issues where the booth commentators and those in the pits were talking over each other. That’s not good. They’re going to have to learn how to better coordinate themselves since I’m pretty sure Iowa will not be the only remote broadcast of the season for NBCSN. That’s all for this week. 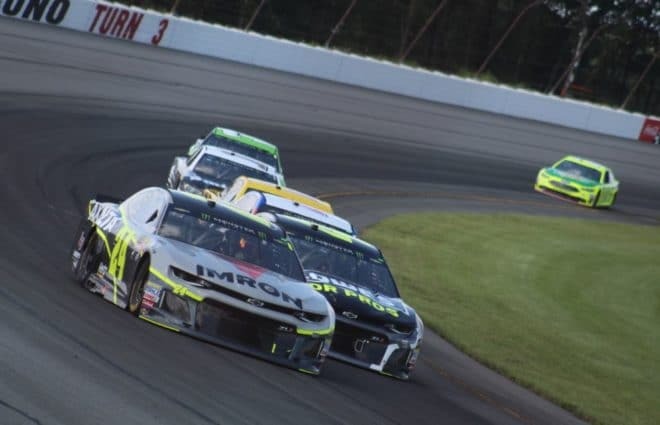 Next weekend, the Monster Energy NASCAR Cup and XFINITY Series teams travel to Watkins Glen for some more road racing. Meanwhile, IMSA will be in action at Road America. Check out our TV listings for the full schedule. We will provide critiques of both the Cup and XFINITY races from Watkins Glen in next week’s edition of Couch Potato Tuesday here at Frontstretch. In the Critic’s Annex Thursday in the Frontstretch Newsletter, we’ll cover the twin-bill of the ModSpace 150 and the Gander Outdoors 150 from Pocono. If you have a gripe with me, or just want to say something about my critique, feel free to post in the comments below. Even though I can’t always respond, I do read your comments. Also, if you want to “like” me on Facebook or follow me on Twitter, please click on the appropriate icons. If you would like to contact either of NASCAR’s media partners, click on either of the links below. As always, if you choose to contact a network by email, do so in a courteous manner. Network representatives are far more likely to respond to emails that ask questions politely rather than emails full of rants and vitriol. It’s always a trial to watch Formula 1 and NASCAR on the same day. The commentary is so vastly different that it makes it seem that adults are doing one race and someone turned a bunch of screaming children loose to do the stock car race. I am always astonished by the amount of minute detail that NASCAR coverage buries us in. They upshift here, they shift down here, let’s watch his feet on the pedals, his car is loose into turn one and tight in the middle, while it’s tight going into turn two. They’re going to add air in the right front tire. I would never have guessed from looking that a pit crew was “…changing four Goodyear tires and adding Sunoco fuel” unless I was told that twenty or so times during a round of pit stops. I loved having Brendan Gaughan was a big addition. He was a natural. He has always been a hoot and I thought his insights were great. I would like for them to use him more. I don’t know if the booth is a fit because he look so natural down on the track. I noted throughout the Cup race that NBC did really good job of focusing more on the action in the back, not just the leaders. It really stuck out with me and made watching much better. I can’t believe you are worried about what Bubba said. I LOL when I heard it. Just out after coming out after a horrible wreck like that probably made his family really know he was ok and had his marbles. Don’t point out problems that shouldn’t exist, you just add to the problem that exists with everything being over the top. It was funny, enjoy it and be happy he is ok.